NS: I’m not sure that the news that the D/E ratio of nonfinancial S&P 500 companies is 18 percentage points higher than before the financial crisis should be a sign that all’s well! But more fundamentally, I’m not sure that ratio is a good yardstick here. As a share of economic output, nonfinancial corporate debt is at an all-time high. With low rates and high earnings, servicing this debt isn’t an issue for most companies — yet. If rates keep rising, servicing that debt could quickly become a problem. Also, as you point out, earnings could fall if there’s a recession. Rates would also fall, but with the federal funds rate at only 2 percent, there isn’t much room below — the Fed would hit the zero lower bound very quickly. Even if the Fed engaged in a large-scale asset purchasing program to push down the rates of risky bonds, these interest rates are also at multidecade lows, so there might not be much scope for that either. Moreover, I think we need to look not just at the amount of debt, but at the quality of that debt. Economists have found that the share of risky bonds in overall debt is as good a predictor of recession as we have. Given the increase in leveraged loans and bonds that are close to junk, the analogy to subprime seems a little too close for comfort. Of course, recession indicators generally predict a downturn that’s still two years in the future (and, of course, those indicators are very noisy, weak signals). So while it’s not time to panic, it does seem like the buildup of risk in the corporate bond market, if left unchecked for a while longer, could be big trouble. NK: The relevance of the data depends on the concern. If the worry is that too much debt is a mortal threat to companies, then D/E ratios are a useful gauge for measuring whether firms are overextended. But let’s dig deeper. Earnings per share for the S&P 500 was $123 in 2017, according to data compiled by Bloomberg. Assuming an effective tax rate of 24 percent, I estimate that earnings before taxes were roughly $162. We also know that earnings before interest and taxes was $163, which implies an interest expense per share of roughly $1. Using that same approach, interest expense has averaged $7 a year since 2009. The last two earnings recessions were among the most severe on record. S&P 500 earnings declined 54 percent from peak in September 2000 to trough in December 2001, and again by 92 percent from June 2007 to March 2009, according to numbers compiled by Yale professor Robert Shiller. I don’t expect a repeat of the financial crisis. But even if earnings were cut in half during the next downturn, S&P 500 companies as a group should have little trouble servicing their debts, even though some individual firms will undoubtedly stumble. On the other hand, if the worry is that the amount or quality of debt augurs a recession, I’m skeptical that we have enough data to make meaningful predictions. The numbers in the paper you cite, for example, stretch back to 1926. There have only been 15 recessions since then, which is a thin sample size. It may be as good a predictor as we have, but let’s put that in perspective: No one has yet discovered a reliable way to forecast recessions. NS: It’s true that forecasting recessions is an uncertain business. But does that mean we should throw up our hands and say because no one can forecast recessions, it’s not worth trying? And not worth worrying about the risks? 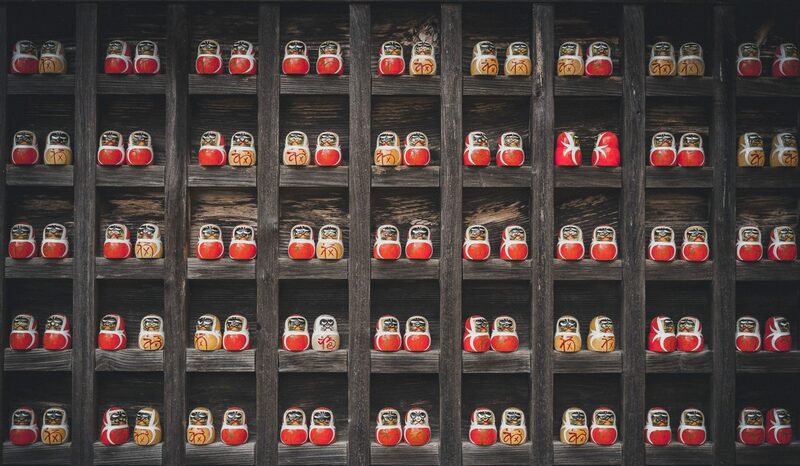 In recent years, a series of economics papers — some of which test data involving many developed countries, not just the U.S. — has been converging on the idea that debt-market sentiment does give us some amount of ability to see recessions coming. When risky borrowers aren’t charged as much of a premium to borrow money, it’s a sign lending standards may have degraded — precisely what economist Hyman Minsky warned about. Given the deteriorating risk premium for corporate borrowers and the rise of risky debt, wouldn’t it make sense to start worrying now, before we pass the point of no return? We may not yet be on the precipice of imminent disaster, but to me that just means that we still have time to head off the problem. NK: By all means, let’s try! But let’s also not lose sight of risks in plain sight. And the biggest risk around corporate bonds right now is that investors are paying too much for them. This is where credit spreads are instructive. Investors are clearly chasing high-quality corporate bonds. 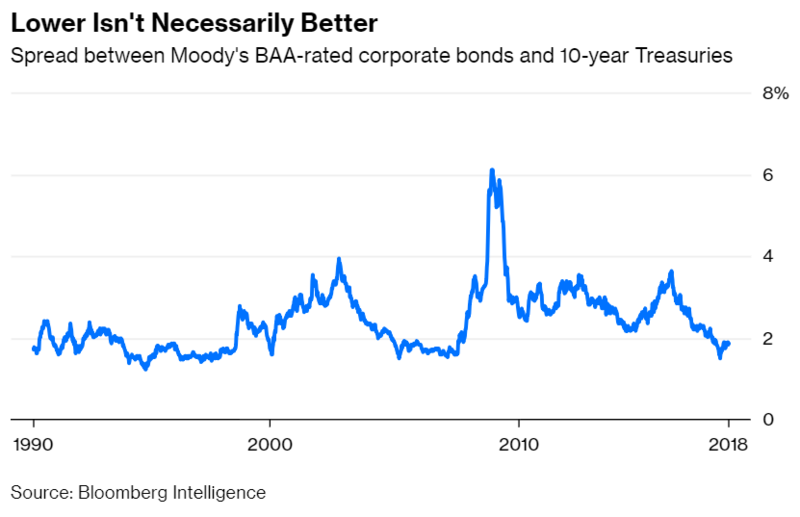 The spread between the yield on Moody’s Aaa-rated bonds and 10-year Treasuries has averaged 1.4 percentage points since 1990. It’s 1 percent today. And as you point out, spreads are narrowing for lower quality Baa-rated bonds, too. Investors are even more keen on junk bonds, which is no doubt contributing to the rising volume of risky debt. The spread between the yield on the Bloomberg Barclays US Corporate High Yield Bond Index and the Bloomberg Barclays US Corporate Bond Index has averaged 4.4 percentage points since 1990. It’s at a little more than half that now, or 2.5 percentage points. The predictable problem is that when the next recession hits, defaults will rise and credit spreads will widen, handing losses to lots of investors. So while we debate whether bullish sentiment or the rise of risky debt signals a recession, we should do the one thing that is almost certain to reduce risk: Tell investors to pare down on corporate bonds until credit spreads adequately compensate them for the risk. Meanwhile, all this cheap debt is a boon to companies, provided they don’t take on too much of it. When sizing up their debt load, let’s be mindful that the financial crisis made borrowing a bogeyman and the pitfalls of fighting the last war.